Clan-Gifts.com - Scottish Clan Names - Clan Arthur Store! The forename Arthur may owe its origins to the Greek word "arktouros" meaning keeper of the bears and in the Celtic world it came to mean "strong as a bear". The name is now known around the world as a result of the legendary King Arthur who may have been a Celtic chieftain around the 6th century. The first reliable record of the name is in Adomnan's "Life of Columba" which tells of a king of the Scots called Aedan mac Gabhrain named his son Arthur, also in the 6th century. The MacArthur clan is believed to have the same roots as the Campbells, but claims that further back they are descended from the legendary King Arthur, are unprovable. The clan is certainly regarded as ancient and there is a Gaelic saying "as old as the hills, the MacArthurs and the Devil". The more established records show that they originated from the district of Lennox, part of the old kingdom of Strathclyde and moved into Argyll. The clan seat was established at Strachur, on Loch Fyne. The clan was at its peak in the 14th century when a MacArthur married the heiress of the progenitor of the Campbell lords of Loch Awe. The MacArthurs from Loch Awe supported Robert the Bruce and fought at the Battle of Bannockburn. Their leader, Mac-ic-Artair, was rewarded with land previously held by the MacDougalls of Lorne (who had supported the Comyns). The MacArthurs became keepers of Dunstaffnage castle. When King James I attempted to subdue the Highland clans who were becoming too powerful in the 15th century, the MacArthurs were amongst those who bore the brunt of his actions. The clan chief, Iain MacArthur, who could summon 1,000 men, was executed in 1427 and most of the clan lands were confiscated. For all practical purposes that was the end of the clan; unlike others who suffered setbacks and managed to recover, the MacArthurs never regained their clan lands, though the name survived as many of the clan dispersed. For a while, a sept of the MacArthurs were the hereditary pipers of the MacDonalds of Sleat, who were frequently at odds with the Campbells. Charles MacArthur, piper to Sir Alexander MacDonald, was a pupil of Patrick Og MacCrimmon. Another group of MacArthurs were armorours to MacDonald of Islay. Towards the end of the 15th century, and into the 16th century, a number of MacArthurs held prominent positions in Argyll. Some of their neighbours became jealous and as a result of a skirmish on Loch Awe, Duncan MacArthur and his son were drowned. The Earl of Argyll ordered compensation to be paid but took advantage of the situation and appointed his nephew John to be leader of the Loch Awe MacArthurs. In the 17th century, one of the MacArthurs of Milton in Dunoon rose to be a baillie in Kintyre and a chamberlain to the Marquess of Montrose in Cowal. Large numbers of MacArthurs fought on both sides during the Jacobite Uprisings in 1715 and 1745. After the '45, many emigrated to the West Indies and North America. John MacArthur (1767-1834) came to New South Wales in Australia in 1790. He was one of the earliest sheep farmers there (he successfully crossed Bengal and Irish sheep and later introduced the Merino breed from South Africa). His sons planted the first vineyard in Australia. In more modern times, US General Arthur MacArthur, whose parents came from Glasgow in Scotland, became Lieutenant-General in the Philippines in 1906. His son, General Douglas MacArthur, became even more famous in the Pacific and the Philippines during WW2 as commander of the US forces in the Far East. The last clan chief of the MacArthurs died in India in the 1780s. He had no obvious male heir and so the hereditary chiefdom of the clan seemed to have died with him. But after a long gap, Canadian-born James Edward Moir MacArthur was recognized by the Lord Lyon in August 2002 as the Arthur clan chief. The new chief was 87 at that date and lived in Edinburgh. He had not sought the title - the research was initiated by a group of senior clan members. The genealogist had to go back to the 16th century to find a common ancestor for the last chief, Charles MacArthur of Tirivadich. The Lord Lyon further decreed that the Chief of Clan Arthur's shield should be "three antique crowns Or (gold) set on an Azure (blue) background". The silver cross molene which, up until now, was thought to form part of the Clan Arthur Chief's shield, has been omitted. James MacArthur's coat of arms now reverts to the earliest, original arms of Clan Arthur, a shield identical to the description given in ancient manuscripts for the legendary King Arthur's blazon. James MacArthur was officially inaugurated in April 2003 but the old chief died in April 2004. The MacArthur clan motto is "Fide et opera" which means "By faith and work". Surnames regarded as septs (sub-branch) of the MacArthur clan are limited to Arthur. 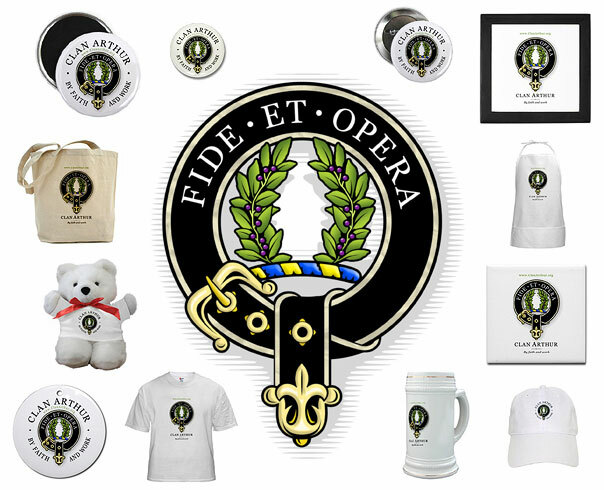 At Clan-Gifts.com we offer a wide range of quality Scottish gift Items, souvenirs, apparel and housewares, all printed with a beautiful rendition of your authentic Clan Arthur crest! Our Clan Arthur gift store stocks over 70 products*, and all items are fully guaranteed! Our great prices, low shipping costs and excellent customer support make us an excellent choice for Scottish Clan Arthur merchandise!